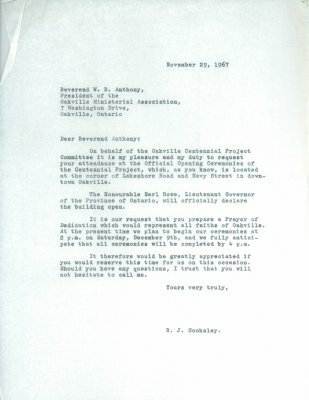 On behalf of the Oakville Centennial Project Committee it is my pleasure and my duty to request your attendance at the Official Opening Ceremonies of the Centennial Project, which, as you know, is located at the corner of Lakeshore Road and Navy Street in downtown Oakville. The Honourable Earl Rowe, Lieutenant Governor of the Province of Ontario, will officially declare the building open. It is our request that you prepare a Prayer of Dedication which would represent all faiths of Oakville. At the present time we plan to begin our ceremonies at 2 p.m. on Saturday, December 9th, and we fully anticipate that all ceremonies will be completed by 4 p.m. It therefore would be greatly appreciated if you would reserve this time tor us on this occasion. Should you have any questions, I trust that you will not hesitate to call me.